In a previous LinkedIn post, “A Secret The Best Management Companies & HOAs Are All In On“, I quoted from the websites of a few top property management companies. The one thing they all have in common is that they agree on the importance of providing a unique experience that is custom-tailored to the needs and vision of the community they serve. That’s easier said than done. In order to facilitate that, property managers need to work with partners who are flexible and can adapt to their specific needs. At GSI we have found that listening to our clients and responding to their individual needs has resulted in innovation. For example, GSI was among the first to deploy Ambassador Guards. This style of security officer has become very popular and we credit this innovation to our clients. By really listening to their needs and looking for ways we can help them achieve their goals, we were able to realize that they needed a security option that was more service oriented and friendly. Good security can be a key amenity for tenants. 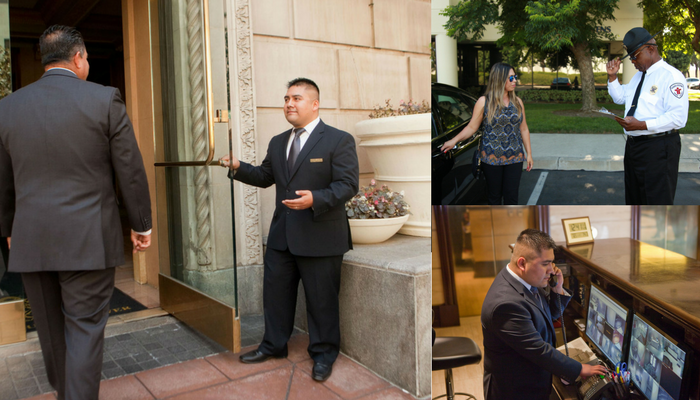 Professional, sharp and friendly security officers that fit client environments can greatly enhance a property’s appeal. We took this to the next level when we starting deploying Ambassador Guards. These officers serve as building ambassadors, greeting and welcoming visitors while simultaneously serving as deterrents for crime. This was a good first step, but we didn’t stop there. As we consulted with our clients further, we realized that they wanted to improve the look of officers so that they can fit in better with the environment. That’s when we started presenting different options for uniforms. Today clients have the option to choose from suits, sports coats, and casual wear. These are just a couple innovations that have resulted from listening to our clients. That’s really the one thing that sets GSI apart. We really listen and as an owner operated organization, GSI has unequaled flexibility, and adaptability to customize services to the specific needs and liking of our clients. It’s an approach that has served us and our clients very well. As a result we are able to retain 98% of our clients, something that is unparalleled within the security industry. We have also experienced amazing growth. This benefits our clients as well. Property managers are able to attract and retain high-quality tenants by delivering a custom tailored experience to their tenants. This helps to set them apart as a property management company that delivers a world-class experience. By working with partners who are flexible and can adapt, property management companies and HOA’s can successfully provide a unique experience that is custom-tailored to the needs and vision of the community.